Photography and filmmaking just got interesting. Canon Central & North Africa (CCNA), has now introduced the EOS R System featuring Frame Mirrorless Camera in East Africa. The experience that comes with the new system expands photographic possibilities in countless ways. The incorporated blend of impeccable optical, mechanical, and electronic design allows one to capture unique moments even in difficult situations. The EOS R System features a pioneering lens mount, built from the best of EOS legacy that dates back to 1987. The introduction of this new system takes the EOS platform to new heights, incorporating the best from the existing system, with even greater levels of performance, lens design possibilities, and creative flexibility. It comes with a new RF mount engineered by Canon experts, who have designed an impressive optical system with a flange back distance of 20mm and a wide 54mm diameter lens mount – allowing for even greater freedom when designing lenses. The new mount has12-pin connections and it enables enhanced communication and power transmission between the lens and camera body, further enhancing lens design options, resulting in higher image quality and enhanced usability. Amine Djouahra, the Senior Sales & Marketing Manager of CCNA said that Kenya and the entire East Africa region plays a significant role in the company’s growth plans. He hopes that the launch of the new system will further cement Canon’s position as innovators in imaging technology. 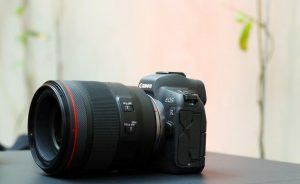 “Canon is globally committed to investing in the unrivaled EOS world with cameras, lenses, and accessories that set new heights in image quality, optical excellence, and performance,” he added. Canon’s lens heritage is bound to push forward the frontiers of creative storytelling and satisfying the ever-evolving needs and demands of many customers. The EOS R System inherits all the existing system advantages including full compatibility with existing EF and EF-S lenses and accessories, when using one of three newly-developed lens adapters, expanding the boundaries of image capture.